The sun is shining, temperatures are warm, and so is the water. The favorable omens of Spring signal the start of the beaches season on Okinawa. This is a big weekend around the prefecture as the public begins packing the lunch boxes, grabbing the swim togs and beach balls, and heads to a couple of the region’s more popular beaches. Naminoue and Zampa beaches on the main island are open for business beginning Sunday, along with the beaches of Miyako Island. They weren’t the first, though, as Haimurubushi Beach on Hohama Island off Yaeyama claimed the nationwide honors March 21st. Haimurubushi Beach has always been the first in Japan to open the season, and always generates a lot of excited water splashers. The Yaebise Ocean Festival kicks off today at Yaebise Coral Reef, off Miyako Island. The three-day festival’s drawing card focuses on these being the three days when low tide is at its lowest all year, putting the spectacular Yaebise reef on display as it rises from the ocean waters. The reef is submerged much of the year, even at low tide. Visitors to Miyako can find ferries and boats carrying hundreds of fellow sun worshippers the site. Boat travel prices are inexpensive, running from Hirara Harbor to the reef for a day of fishing, water activities and shell collecting. Ikei Big Time resort opens its beaches next weekend, April 9th, while the rest of Okinawa’s beaches become public on Sunday, April 10th. Naminoue Beach is Naha’s pride and joy, located between the city’s two primary seaports. There are actually two beaches—one city owned, one private—available for use. The city’s Naminoue Beach is small, but safe and secure. Swimming areas are roped in and protected from water sports enthusiasts, jet skis and kayaks. Lifeguards are on duty daily from sunrise to sunset. Food stands are available within a few meters of the beach. Restrooms and showers are vailable, and both beaches have smooth, sandy beach. Travel south on Highway 58 to Naha, looking for signs for the right hand turn to Naminoue Beach in the heart of the city. Tropical Beach is located at Ginowan Seaside Park, just south of Camp Foster. It sits next to the Okinawa Convention Center, and offers a clean beach and breakwaters area, as well as picnic tables. Barbeques are allowed, and the beach facility offers grill rentals, as well as a host of other beach necessities and tents. Restrooms are available. Travel south on Highway 58 to the Okinawa Convention Center bypass (or north, from Camp Kinser). The ANA Laguna Garden Hotel and the Convention Center are landmarks for the nearby beach. Parking is limited at the beach, but ample parking is available about two blocks away. Sunset Beach is in Chatan, close to both Camps Lester and Foster, and also Kadena Air Base. The beach and its adjacent pavilion are free, and offer picnic tables. Sunset Beach has clearly identified swimming zones, marked by ropes. To visit Sunset Beach, travel north (or south) on Highway 58 to Camp Lester. Beach signs are clearly marked at the Camp Lester Gate #1 intersection. Oura Wan Beach is Camp Schwab’s base beach. Operated by Marine Corps Community Services, the beach offers swimming, fishing and boating activities as well as snorkeling. Sailboats, power boats, jet skis, windsurfing boards and kayaks are available to rent. There’ s also a fishing bait and tackle shop at the beach, and there are charter boat rentals. Lifeguards are on duty daily. Travel north on Highway 329 to Camp Schwab. 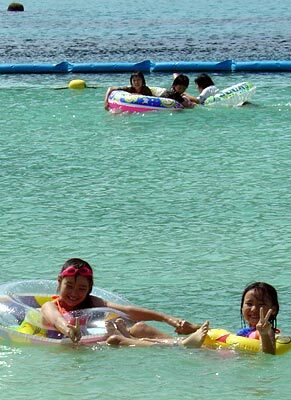 White Beach Naval Station Beach features a beach, a swimming pool, cabins and camping and trailer rentals. All base facilities are available. Travel north on Highway 330 from Camp Foster, turning right at the Agena intersection to Route 10. Be alert as the road quickly veers right and becomes Highway 8. Travel east to the end of the road, at the White Beach Main Gate. Okuma Joint Services Recreation Facility is located on Okinawa’s far northwest side, north of Nago City. A full recreation complex operated by the Air Force, Okuma has everything from cabanas and cabins to camp sites. Most have been renovated in recent years. Okuhma has beach, boats and even a nine-hole golf course. Reservations are a must for anything more than a day visit, as the extremely popular beach is often sold out. Courtney Beach is small and compact, and located on Camp Courtney proper. Uken Beach, Gushikawa Beach and Teruma Beach are on the island’s east side, near White Beach. These Okinawa beaches are far less crowded than many, and are much less developed. Rest rooms are available. From Highway 329, travel east on Highway 8 toward White Beach. Watch for the beach signs. Ikei Island Beach is in the same area, near White Beach. It is on a small island connected to Okinawa by a bridge. Travel Highway 10, then 8 toward White Beach. Turn left at Ikei Island signs, cross the bridge, and travel about ten kilometers to the beach. There is an entry fee for this beach. Torii Beach is located on the U.S. Army military installation in Yomitan. It has excellent beach, and facilities are new and plentiful. Cottages are available for rent, there’s a water park and water slide, sports equiment rental, and free campsites. Travel north on Highway 58 to Yomitan, turning left onto Route 6. Enter Torii Station Gate One, then follow signs to the beach. 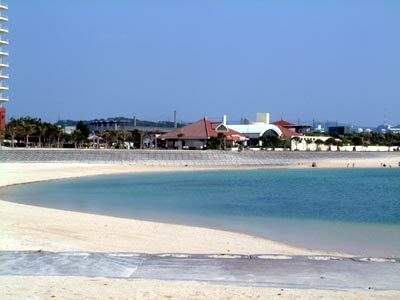 The southeast side of Okinawa has a number of secluded beaches with limited facilities and services. Most offer excellent snorkeling opportunities. Several worth mentioning are Azama Sunsun Beach, Komaka Bach, Hyakuna Beach and Mibaru Beach, all loated on Highway 331. To reach Highway 331, travel south on Highway 331 to Yonabaru Town, where 331 picks up. MWR and MCCS offices on bases have island maps which pinpoint these and other beaches on Okinawa.